As the operational targets became ever more distant and ever greater payloads were being carried, the Mistel arrangement became more complicated. One idea in August 1944 was to convert 100 He 177 A-З or A-5 to Mistel bombs for dropping on pin-point targets. The order for 98 of the 100 conversions was cancelled, however, in September 1944. In a conference on 20 November 1944 attended by General-Engineer Rudolf Hermann, the future use of the He 177 was discussed and Heinkel asked for a timetable to be set for the two machines. Each conversion required 7,500 man-hours. At the end of November Heinkel stated that, if so instructed, the first He 177 Mistel could be ready for testing in ten days, the second in fifteen. The first machine would be completed on 6 December and the other on 14 December 1944. The only foreseeable problem was the finked guidance system. Numerous Ju 88s with Fw 190 F-8s as control aircraft were found by Allied troops in central Germany. the necessary labour’. On 2 December it seemed clear that from the beginning of 1945 only 20 conversions could be started. RLM required only two machines definitely, however, and the first was promised to be ready for transfer to Nordhausen on 8 December. This date was not met. On 8 January the Technical Directorate at Heinkel set the completion date for the first He 177 Mistel for 1 February, and 15 February for the second, but the two He 177/Fw 190 Misteh were already doubtful in early January. Some of the construction hangars at Zwolfaxing could not be heated for shortage of coal. 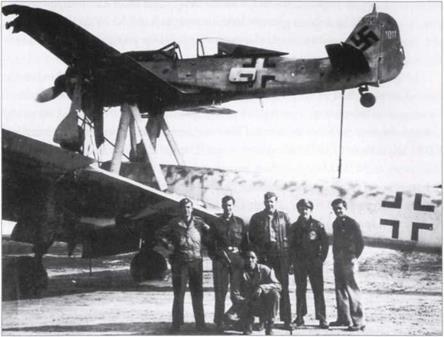 All energy was being concentrated for He 162 production at Heidfeld to guarantee the night shift would be able to work, although the frequent power cuts made work almost impossible at Heinkel Slid. On 28 January the Mistel project was suspended indefinitely ‘for lack of coal’. The He 162 enjoyed unrestricted priority over all work at Heinkel Vienna. On 12 March the ‘Great Mistel’ was abandoned and the only existing guidance control system for the pairing shipped away. The majority of the Heinkel workers on the Mistel project were reallocated to the Volksjager.